HONOLULU, Hawaii, December 28, 2012 (ENS) – The federal government has signed an agreement to provide $1.55 billion to the City and County of Honolulu to build Hawaii’s first rail transit system, but the downtown part of the route is still up in the air. The funding agreement seals the federal commitment to the $5.1 billion project. Local taxpayers and tourists are providing $3.358 billion, about 65 percent, of the total project cost through a half-percent General Excise and Use Tax surcharge. “The Honolulu rail transit project, the first of its kind in the state, will bring new transit options to the growing region and create a modern transportation system that is built to last for future generations,” said U.S. Transportation Secretary Ray LaHood at the signing ceremony December 19. The 20-mile elevated rail line with 21 stations will connect Kapolei in West Oahu, Pearl City, Aloha Stadium, Pearl Harbor Naval Base, Honolulu International Airport, downtown Honolulu, and Ala Moana Center, the largest shopping center in the Pacific, and the easternmost point of the rail line. Every aspect of the project has been hotly debated for years, and controversy over the downtown portion of the rail route continues because Native Hawaiian ancestors were buried for centuries under what is now downtown Honolulu. As early as 2005, the Oahu Island Burial Council, a state agency, warned that the rail project might disturb Hawaiian burials. In 2008, the Burial Council protested the selected rail alignment in downtown Honolulu because it would impact burial concentrations. On August 24, the Hawaii Supreme Court ruled unanimously that the city must complete an archaeological survey for the entire 20-mile rail corridor prior to project approval and prior to construction. That archaeological survey is now underway. In November, a human skull fragment was found in an survey trench dug into a parking lot near Ward Avenue – the sixth time human remains have been found in the path of the rail project. The most recent find was in a trench in the parking lot of a Ross Dress for Less store, and is believed to be a skull fragment from a young adult, according to Hinalei-moana Wong-Kalu, who chairs the Burial Council. Native Hawaiian cultural practitioners are urging the head of the Honolulu Authority for Rapid Transportation to find a way to leave burials and other human remains in place when they are discovered along the rail route. Until the archaeological survey is complete, the downtown portion of the route, called phase four, cannot be determined. On Thursday, U.S. Ninth Circuit Court of Appeals Judge A. Wallace Tashima ordered a halt of any construction activities in phase four of the 20-mile route, but did not issue an order halting construction on the first three phases. Judge Tashima ruled that the city cannot proceed with downtown construction until it abides by his earlier decision that the city and federal officials reconsider alternatives to routing the rail line through a tunnel under Beretania Street and reconsider the project’s impact on a park and on Native Hawaiian traditional and cultural sites along the route. 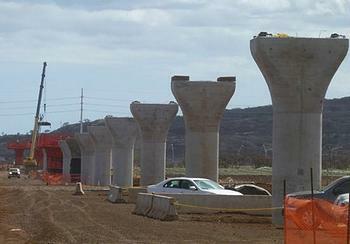 The city had halted construction on the rail project after the Hawaii Supreme Court said in August that archeological surveys must be completed on the entire 20-mile route before construction could continue. The city has said the survey should be completed shortly. The entrance of each community rail station will be based on residents’ input from station design workshops to reflect the community’s individual character and history. Energy-efficient lighting and water-saving devices will be included in the stations. Buildings and landscaping may include local stone, native plant species and artwork.